The Dutch Flat and Donner Lake Wagon Road of 1863 started in (guess where) . . . Yesterday was nice enough, being between storms, that my wife and I decided to go out for lunch and I recommended the Dutch Flat Hotel, built in 1852. It was only about a forty minute drive but I extended the trip by taking the Lincoln Highway rather than the freeway. It is a California historic monument and well deserving of that title. Lunch was delightful in the restored hotel. Being that it was December and just after a storm, it was not exactly brimming with tourists. The staff was attentive and food quite recommendable. Unfortunately the museum was closed. 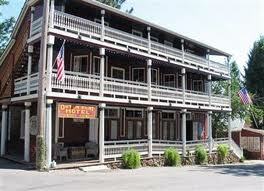 Dutch Flat itself has an interesting history and is one of those incredibly “cute” Gold Rush towns found in the Sierras. It was for a time the end of the Central Pacific Railroad as operations to extend into the rugged terrain of the mountains commenced. It is just off the Lincoln Highway and I-80 so can be easily visited. We actually have talked about buying a house there. The next time you are racing on I-80 just take a few minutes and head over to see Dutch Flat. It will be worth your while. This entry was posted in Lincoln Highway, Sierra Nevada History. Bookmark the permalink.